Observation - Puss Moth caterpillar - UK and Ireland. 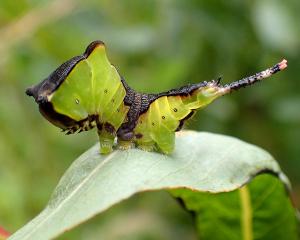 Description: Beginning about 4 July, these monocolour caterpillars began eating a willow. By the 11th July (pictures) there were quite distinguished. But today, today, they are elegant beyond description. Beginning about 4 July, these monocolour caterpillars began eating a willow. By the 11th July (pictures) there were quite distinguished. But today, today, they are elegant beyond description.